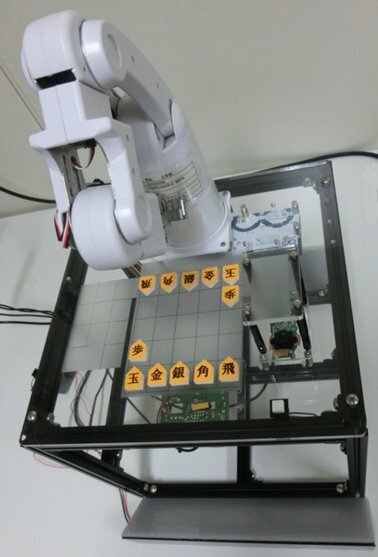 The authors developed a low-cost, safety shogi robot system. A Web camera installed on the lower frame is used to recognize pieces and their positions on the board, after which the game program is played. A robot arm moves a selected piece to the position used in playing a human player. A fast, robust image processing algorithm is needed because a low-cost wide-angle Web camera and robot are used. The authors describe image processing and robot systems, then discuss experiments conducted to verify the feasibility of the proposal, showing that even a low-cost system can be highly reliable. G. Koutaki and K. Uchimura, “Fast and Robust Vision System for Shogi Robot,” J. Robot. Mechatron., Vol.27, No.2, pp. 182-190, 2015. Japan Productivity Center, Leisure Research 2011. T. Kurita, M. Miwa, and T. Chikayama, “Automatic position recognition method using image information in shogi,” IPSJ Game Programming Workshop’07, 2007. T. Takayanagi and M. Takahashi, “Automatic Generation System of Shogi Record Using a Camera Set Obliquely Upward,” Proc. of the 2009 IEICE Society Conf., 2009. F. Groen, G. Boer, A. Inge, and R. Stam, “A chess playing robot: lab course in robot sensor integration,” Proc. of IEEE Instrumentation and Measurement Technology Conf., pp. 261-264, 1992. A. Reinefeld, “An Improvement to the Scout Tree-Search Algorithm,” ICCA J., Vol.6, No.4, pp. 4-14, 1983. H. Kaindl, “Dynamic Control of the Quiescence Search in Computer Chess,” Cybernetics and Systems Research, pp. 973-977, 1982. D. I. Barnea and H. F. Silverman, “A class of algorithms for fast digital image registration,” IEEE Trans. Comput., pp. 179-186, 1972. J. Fairbairn, “Shogi for Beginners,” 1984.